Dutch Harbor is a harbor on Amaknak Island in Unalaska, Alaska. It was the location of the Battle of Dutch Harbor in June 1942, and was one of the few sites, besides the attack on Pearl Harbor in Hawaii, in American territory to be bombed by the Japanese during World War II. Dutch Harbor is now the home of an important fishing industry. Druzhinin, the commander of the Russian ship Zakharii I Elisaveta, is credited for discovering the deep-water harbor now known as Dutch Harbor. Dutch Harbor is located within the Aleutian Islands of Alaska, more precisely on Amaknak Island in the Fox Islands. 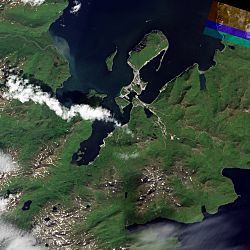 A mile long spit extending from the northeast end of Amaknak Island makes Dutch Harbor a natural port, protecting ships from the waves and currents of the Bering Sea, although winds off the Bering Sea have tossed shipments from decks of ships. Dutch Harbor is close to some of the richest fishing in the world, and it is ice-free. The native people are known as the Aleut. When the Russians arrived, they exploited the Aleut by taxing them in fur pelts. The Aleut accepted the Russian Orthodox Church because it offered them support and educated their children. The Russian-American Company operated from 1799 through the mid-1800s. It used Dutch Harbor in the transport of goods, mainly seal and sea otter fur. In 1867 Russia sold Alaska to the United States. Fur was the main export in Alaska after the United States took control. Hutchinson, Kohl, & Company of San Francisco took over the assets of the Russian America Company in 1867, but it sold out in 1868 to the Alaska Commercial Company. A decline in the sea otter population slowed trade in 1895. The year 1897 brought a crowd of potential prospectors looking to get rich from the Alaska gold rush. World War II brought the U.S. Army and Navy, and their supplies, to Dutch Harbor at the Dutch Harbor Naval Operating Base and Fort Mears, U.S. Army. The first army troops arrived in June 1941 and the navy air base was finished in September 1941. During the war, Dutch Harbor was also used to house refugees evacuated from other Aleutian Islands. In early 1942, intelligence officers of the U.S. Navy predicted that there would be a Japanese attack in the North Pacific area, and naval codebreakers warned Dutch Harbor of the impending attack. On June 3, 1942, at 5:45 a.m., 20 Japanese planes from two aircraft carriers of the Imperial Japanese navy bombed Dutch Harbor in the "Battle of Dutch Harbor," targeting the radio station and the petroleum storage tanks. By mid-1942, a small submarine base was in place, with a squadron of old U.S. Navy S-class submarines. By May 1943, a peak of 10,151 sailors and 9,976 soldiers were stationed at the base. In 1947, the last units of the U.S. Navy left Dutch Harbor and the base was decommissioned. In 1952, the U.S. Army Corps of Engineers stored 232 surplus buildings on 448 acres of land of the Fort Mears Military Reservation. During the mid-1980s, the US government finally funded a cleanup of the derelict fort, and the area was turned over for commercial use. The U. S. Navy also scrapped its air base on it. As the economy and population grows, the town of Unalaska is having trouble meeting the needs of citizens and travelers. Infrastructure such as water treatment plants, landfills, doctors, and police are pushed to the limit. Unalaska is expanding to meet the needs of its citizens, employees and travelers. Kloosterboer, a large temperature controlled logistics company, opened its facility in 2010. It provides processing, storage, and logistics to the fishing industry. In recent years, Dutch Harbor has become a full service port providing all the fishing industry needs. It is the harbor featured in the Discovery Channel reality television series Deadliest Catch. Dutch Harbor is ranked as a top fishing port with more than a billion dollars transferred each year. Huge harvests of pollock and cod in the Bering Sea are part of this total. The Bering Sea has a continental shelf that is one of the world’s largest, and supports a rich ecosystem. Buildings burning after the first Japanese attack, 3 June 1942. View of Dutch Harbor ramp area with an USCG C-130 Hercules in stand by for an emergency flight. Crab boats docked at Dutch Harbor in January 2009. Dutch Harbor Facts for Kids. Kiddle Encyclopedia.